MODULAR HOME BUILDER: Multifamily Starts Down 38% in September - Ouch! Multifamily Starts Down 38% in September - Ouch! 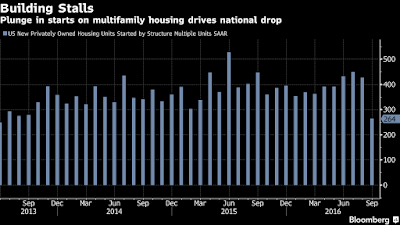 New-home construction in the U.S. unexpectedly fell in September on a plunge in multifamily building while permits rose more than forecast, in signs of fitful progress in residential real estate. Residential starts declined 9 percent to a 1.05 million annualized rate, the lowest since March 2015, a Commerce Department report showed Wednesday in Washington. The median forecast of economists surveyed by Bloomberg called for a rise to 1.18 million. Permits, a proxy for future construction, jumped 6.3 percent to the fastest pace since November. The latest figures raise the likelihood that homebuilding, which accounts for about 3 percent of the economy, dragged down gross domestic product growth in the third quarter for a second straight period. While hiring is solid and mortgage costs are near historical lows, faster wage gains and broader access to credit would boost sales and encourage developers to break ground on more residences. “Residential construction may have been a drag on growth in the third quarter,” said Ryan Wang, an economist at HSBC Securities USA Inc. in New York. 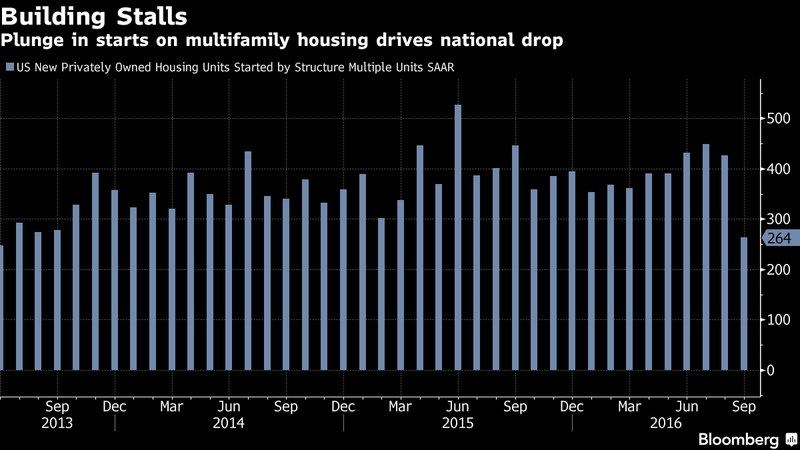 “Multifamily construction is starting to level off,” though “single-family still seems to be on a gradual growth trend,” he said. Work on multifamily homes, such as townhouses and apartment buildings, slid 38 percent to an annual rate of 264,000. Data on these projects, which have led housing starts in recent years, can be volatile. Starts on structures with at least five units were the lowest since June 2013. Estimates for total housing starts in the Bloomberg survey of economists ranged from 1.1 million to 1.2 million. The previous month was revised to 1.15 million from a 1.14 million pace.